To be clear, we are not advocating Israeli withdrawal from the Golan Heights under the current circumstances. Syria is in shambles, swarming with belligerent extremist groups, and Iran has gained a foothold there in the course of Syria’s horrific civil war. There is no credible Syrian regime with whom Israel could conduct peace negotiations. Under the current circumstances, returning this territory to Syria could put Israeli security in jeopardy. In 1981, the US government under President Reagan joined the United Nations Security Council’s unanimous adoption of UNSC Resolution 497, which proclaimed that the “Israeli decision to impose its laws, jurisdiction and administration in the occupied Syrian Golan Heights is null and void and without international legal effect” and called on Israel to rescind its decision. 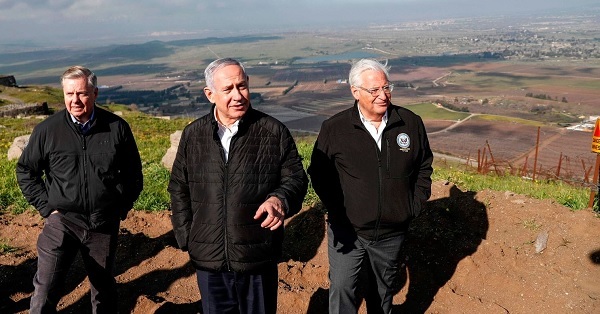 Acceptance of annexation in the case of the Golan Heights, contra international law and longstanding US policy, would enflame anti-US sentiments in the Middle East and beyond, while further eroding US moral authority around the world. There is simply no affirmative reason to make this policy change. If the Trump administration does it now, on the eve of Prime Minister Benjamin Netanyahu’s visit to Washington before the Israeli elections, the only reason can be Trump’s desire to boost his personal friend and ally’s electoral fortunes. That’s wrong, and it’s no basis on which to conduct US foreign policy.